You have probably heard about the protests going on in Ukraine. As I write this, it has been four weeks since they began and there are still hundreds of thousands to a million people protesting in the center of Kyiv. In November, the Ukrainian president dropped his support of joining the European Union, in favor of forging tighter alliances with Vladimir Putin and Russia. The younger Ukrainians clearly consider themselves European. They want to be western and they do not like the idea of trying to bring back a Soviet style of life. Couple that with the fact that the president was elected on the promise of joining Ukraine to the EU and you have fertile soil for the protests which have occurred of late. What is most amazing to me is that the protesters who have been gathered for a month have eschewed violence in their civil disobedience. I hope that could happen in America, too, but I am not convinced that it could. I am not surprised that the colleges and churches in Ukraine have been the incubators for the movement. Universities have long been known to spawn wide-eyed optimists who do not know better than to believe that there could be a utopian earth. Churches have also produced their share of people who believe in a Kingdom on earth. God bless them for that. Even though neither is considered realistic to the old guard, I am glad there are places still perpetuating such notions. We can trace college and church to the protestant Reformation, the formation of America, and the abolition of slavery among other things. 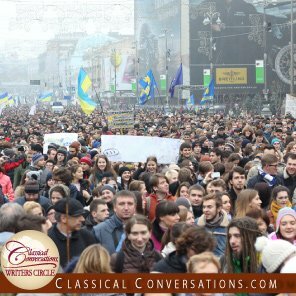 In Kyiv, the instigators of the initial protests which have now garnered international attention were very easily traceable to the city’s liberal arts colleges. When the president tried to squelch the demonstrations with heavy-handed Soviet tactics, the leaders of the Ukrainian Orthodox Church stood between the soldiers and the students. I hope the protests result in the monumental level of reform the Ukrainian people desire. Either way, I am thankful to the church and the university for promoting the idea that tyrants, no matter how lofty, can be challenged by peaceful groups of ordinary men and women.